American companies are dumping $1 billion a year (or more) into improving employee engagement. What do we have to show for that massive investment? Between 2000 and 2018 (nearly two decades! ), the percentage of employees that we call “highly engaged” has increased from 30% to 34%. That’s a horrible return on investment. But hey, just give us another 300 years or so and we’ll hit the 100% engagement mark! Despite this glaring lack of success, most organizations continue to run engagement surveys and continue to be disappointed with their results. 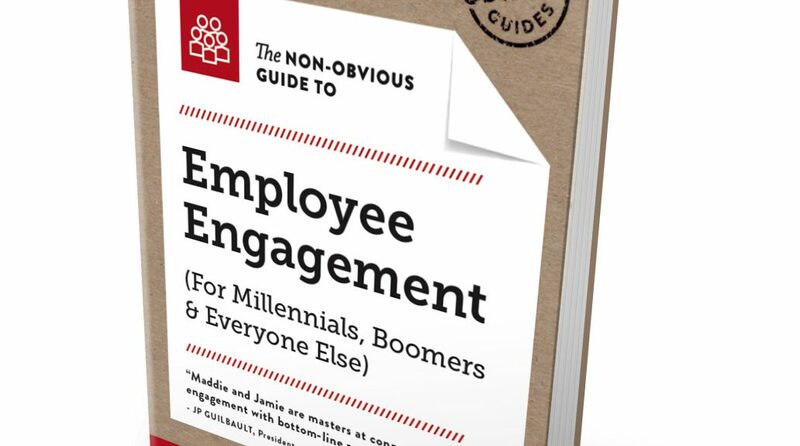 In our latest book, The Non-Obvious Guide to Employee Engagement (For Millennials, Boomers, and Everyone Else) we’ve identified an alternative. The fatal flaw in our current approach lies in the fact that nearly all employee surveys are focused on approval, happiness, and satisfaction. While it seems logical to find out what people like or don’t like and try to fix those “pain points,” the surprising truth is that employee engagement and happiness/satisfaction are actually two different things, and (perhaps more importantly) — they aren’t even particularly related. Success is the true driver of employee engagement. When you create an environment where everyone can be successful — and that includes personal success, job-related success, and contributions to the overall success of the enterprise — you will have high employee engagement. Happiness and satisfaction may go along with that, but not always. In fact, truly engaged employees will use their dissatisfaction as motivation to try to make things better. When you start interfering with employee success, you’ll start losing engagement. For example, if your employees can’t get the resources they need to be successful, key people in other departments are simply horrible at collaborating, or red tape gets in the way of serving your customers, your people will feel like they’re spinning their wheels, and engagement will drop. Instead of using surveys to measures likes and dislikes, foster a deeper understanding of the patterns inside your workplace culture. When you find and fix the patterns that get in the way of success, engagement will rise. For example, we worked with a company that was frustrated because their people’s deep expertise was trapped behind departmental lines, and customer service was suffering. To fix the problem, they made some changes to key processes (like who attends which meetings) and technologies (like having more people share information through internal portals), and were able to deliver better solutions to the customers as a result. In other words, and as their success grew, so did their employee engagement and retention. The sooner you abandon your attempts to make your people happy and focus instead on making them successful, the sooner you’ll be able to unlock the potential of a fully engaged workforce. Jamie Notter and Maddie Grant are Co-Founders and Culture Designers at Human Workplaces, and the co-author of three books, including the 2019 release, The Non-Obvious Guide to Employee Engagement (for Millennials, Boomers, and Everyone Else). They can be reached at Human Workplaces. Previous Article Previous post: Which Content Marketing Activities Should You Automate?